Social Media at the Starting Blocks: A Look at Financial Institutions in Europe and the United States. 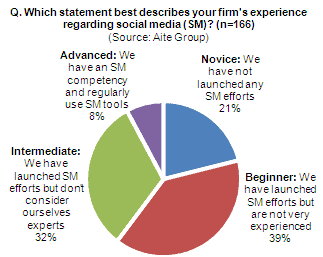 A new report from Aite Group examines financial services firms’ current and planned use of social media to support their marketing efforts. The 2010 Social Media Report for Marketers. Nearly 90% of senior marketing professionals use professional and social networking tools. 55% read and share content through social media channels daily. 75% have increased their marketing expertise through social media. Mobile swiftly moves to core of all brand communications. This year, mobile began its move into the core of all brand communications and I predict that this monumental shift will be complete in the next two to three years. LinkedIn CEO: We’re adding a new user every second. CEO Jeff Weiner spilled some new statistics Wednesday highlighting the business networking site’s rapid global growth. China and Brazil are the fastest growing regions. The site now has 85 million users — and the latest 1 million signed up within the last nine days. You Can Now Log in to MySpace with Facebook. In a move that has been rumored for nearly a year, MySpace users can now log in to the once dominant social network using Facebook. Forget Calling Home… Social Media Replaces Phone, E-Mail as Way to Keep in Touch on the Road, Sheraton Survey Reveals. Whopping 80% in study say they access social media sites throughout the day. More than 60% now use social media to reach family, friends on the road. 39% say they can’t live without social media with one-third of users logging on multiple times an hour. Fascinating Social Media Facts of Year 2010. Most of these facts are based on surveys (online or offline) over a sample size, these are also mentioned to ensure that we get the perspective of each of these facts. Twittering the day away. As social media makes its way into the workplace, executives are weighing the potential risks and benefits. Half of CFOs interviewed said their greatest concern is that employees are wasting time during business hours using sites such as Facebook and Twitter.